Throughout this wedding photography experience, I honestly felt as if I were a member of the couple’s family, and this Center for Urban Horticulture wedding photograph clearly illustrates how I aim to get close, so that I can create impactful, intimate images that feel like they were taken by your friends or family. 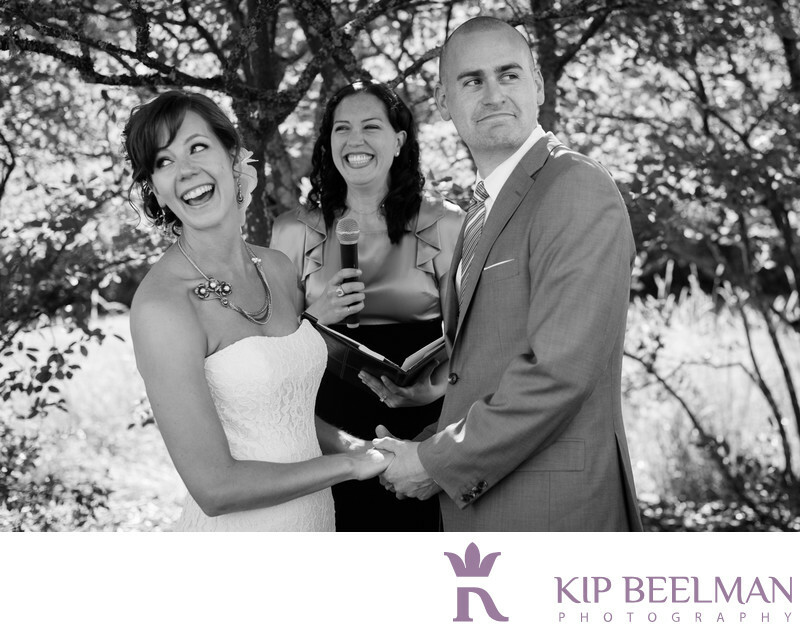 Taken during an incredible wedding ceremony, the mirth and joy shared by everyone is so clear in this sweet and remarkable moment. You can also see how beautiful and poignant Center for Urban Horticulture wedding photography can be. Now a part of the University of Washington Botanic Gardens in Seattle, the Center for Urban Horticulture is a versatile, beautiful and central venue when it comes to wedding photography, ceremonies and events. It offers great rooms to get ready in, gorgeous outdoor spaces for wedding ceremonies and portraits, and a great layout for fun-filled receptions and the ever-popular photo booth. If you are seeking an outdoor space for wedding photography or the ceremony itself, the center offers an incredible 16 landscaped acres of gardens, wildlife, nature as well as opportunities for smiles, candid shots and images that you will treasure for a lifetime – like this magical moment. We nestled under some trees for a ceremony that felt both intimate and grand and was full of celebration. I appreciate the opportunity to unobtrusively take close-up shots that show the look of love, hands, jewelry, smiles, mischief and moments to remember forever. Location: 3501 NE 41st St, Seattle, WA 98105. Keywords: Outdoor Wedding (72), Seattle (111).